ForeScout’s expected pricing range is still TBA. Comparable public companies trade at a mid-to-high single digit multiple on sales, as shown in the table below. 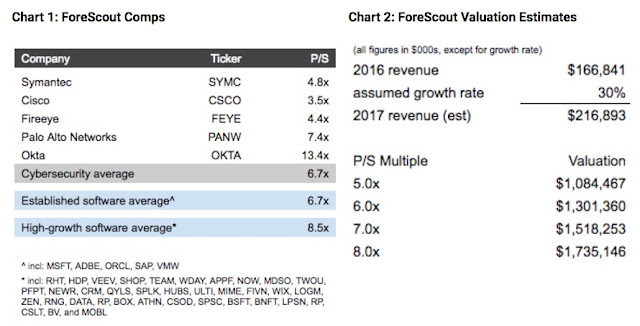 Note that ForeScout generates revenue from hardware & software sold on a perpetual license (vs subscription); as such, we would expect its relative valuation to fall below companies with SaaS models. Our valuation estimate uses a P/S range of 5.0x-8.0x and assumes 2017 revenue growth continues at its YTD pace of 30%. Note that ForeScout’s last funding round implied a $1.1B valuation. (+) Revenue growth is robust. Revenue growth is a key component of valuation, particularly for software companies. 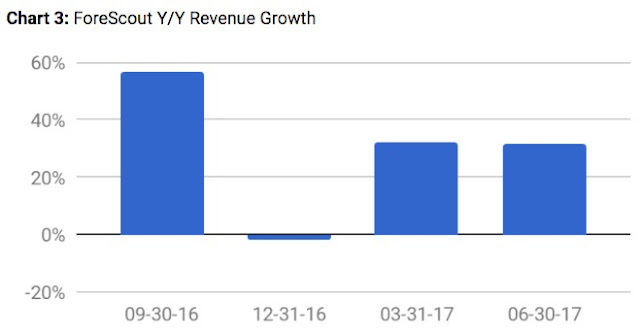 ForeScout has posted strong revenue growth numbers over the past several quarters. Note that while 4Q16 growth doesn’t look great, the number reflects a difficult comp in 4Q15, when multiple years of revenue were recognized on a non-standard contract [relevant excerpt from S-1 below]. Coincidentally (? ), the revenue boost from this non-standard contract occurred immediately prior to ForeScout’s Series G funding round in January 2016. Nevertheless, 30%+ growth so far in 2017 suggests the business continues to see strong demand growth. (+) Customer service retention rates remain solid. 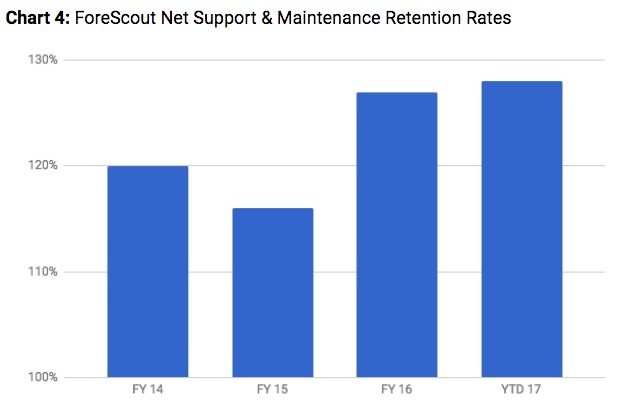 ForeScout has maintained retention rates on its support and maintenance contracts of well over 100% since 2014. The strength of these numbers suggest the company may be well positioned to drive top-line growth by capturing additional revenue from its existing customer base (e.g. upgrades, other services). Existing customers typically carry lower acquisition costs versus new customers. (+) Sales productivity stacks up favorably. 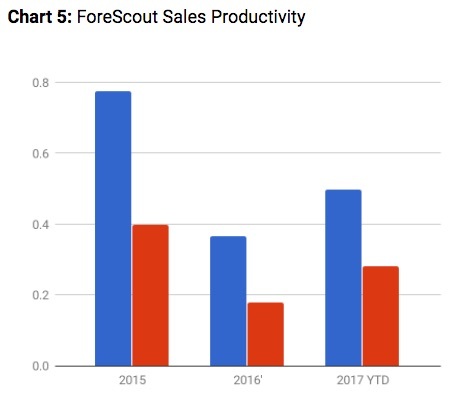 Sales productivity here is estimated as incremental revenue less costs to generate that revenue over prior period sales & marketing spend (ForeScout notes its sales cycle is typically 6-12 months). The company stacks up relatively well to higher-growth peers that also sell software on a perpetual model. Note in chart below that 2015’s outsized ratio probably “borrowed” from 2016 (and perhaps even 2017) given revenue recognition item mentioned above. (-) Net margin still stubbornly negative, though may be some nascent signs of improvement. Net margins are still very negative. Gross margin compression partially to blame (see below), while R&D expenses also seem to be creeping higher as a % of revenue. Note that there appears to be a seasonal pattern to margins (with the exception of 4Q15...again remember the item above). Looking at Y/Y trends, margins do seem to be showing some small improvement...emphasis on small for the moment. (-) Gross margin has slipped. 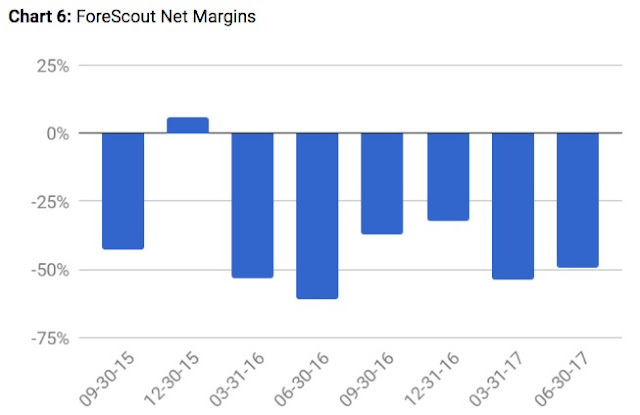 ForeScout has seen a little over 400bps of margin contraction since 3Q15. Definitely a trend to keep an eye on. An unfavorable mix-shift is partly to blame. Chart 7 shows that the percentage of revenue that ForeScout earns from product sales (vs maintenance & other services) has declined. The drop may be attributable to seasonal/cyclical factors. Product sales typically carry higher gross margins compared to services. What else caught our eye? ForeScout sells its products under a perpetual license versus the subscription model employed by most next gen software companies. While there are many valid reasons for perpetual license models, subscription has gained popularity among software companies and investors alike as they typically afford greater cash flow stability and visibility. Perpetual licenses could also impact ForeScout’s ability to expand with smaller and medium-sized companies, which tend to prefer the flexibility of subscriptions. Additionally, S-1 notes that ForeScout underperformed bookings targets in 2H16. No update provided on bookings trends in 2017.